Patricia Marx is one of the finest comic writers of her time, as readers of The New Yorker and fans of Saturday Night Live already know. Her fiction debut is an endlessly entertaining comic novel about one woman’s romantic fixation on her first boyfriend. "Laugh-aloud funny, fierce, witty, incisive, well-written, engaging, and intelligent. A wonderful book." 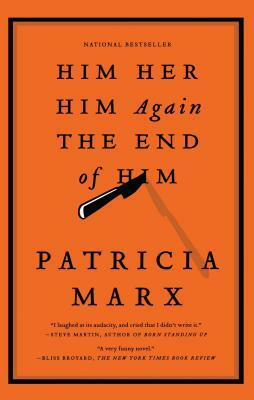 "As funny as Kingsley Amis and Nora Ephron, yet wholly original, that Patricia Marx is a crackerjack (lady) writer. Way more talented than Gummo!" "Patricia Marx's dazzling book is painfully hilarious, and at the same time hilariously painful, and, for that matter, flat-out hilarious. Frankly, I've never enjoyed a bad relationship this much." "Patty Marx is a complete original, with a dry, observant wit, a feeling for descriptive detail, and a cool kind of warmth, all entirely her own. Her tale of love sort of found and sort of lost in Cambridge and Manhattan will make any reader laugh hard and think harder." "Patricia Marx is a wonderfully funny writer." "If you're like me, you read a blurb and think, Oh, I didn't know they were friends. But I hardly know Patty -- we had dinner once (with other people, and all she had was a Diet Coke). So you can believe me when I say: This may be the funniest book I've ever read. The funniest. Ever. And keep in mind I didn't write this blurb as a favor to Patty. I did it for you. So you'd be able to pick out the funniest book in the store and take it home and laugh your head off." "I laughed at its audacity, and cried that I didn't write it."